There two xStarter actions what allows you to synchronize folders on a local computer and on FTP server. This is FtpSyncDownload and FtpSyncUpload actions. They have similar parameters but do different things. 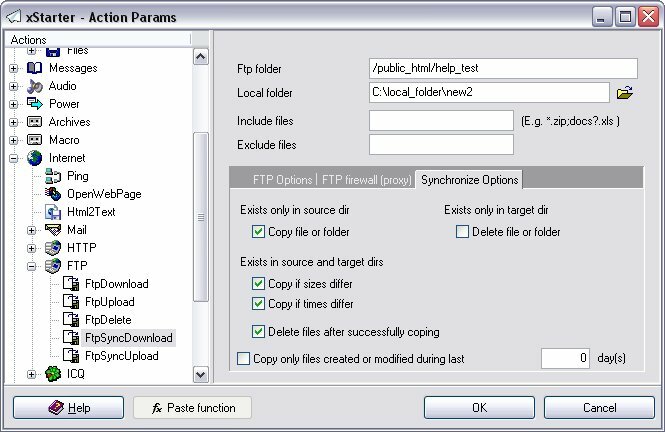 Here are the xStarter operations related to FTP folder synchronization. FTP server folder. For root FTP folder it's possible to use "/". Synchronize files only by specified mask, for example "*.zip;docs?.xls". If this field is empty then using mask "*.*". Do not inlcude in synchronization files by specified mask, e.g. "*.exe". This field have higer priority then Include files. This is a name of the FTP server (for example, "ftp.xStarter.com"). FTP server port. Usually must have value 21. This setting defines a login name for the user on the FTP server. This setting defines a password for the user on the FTP server. Binary mode of files transfer. Passive mode for FTP connection. This connection mode needs if computer have not directly Internet access and connect to FTP server through firewall or proxy server. There are several connection modes available. 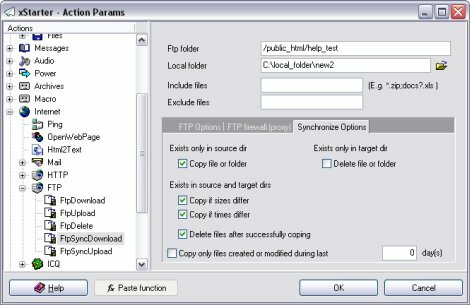 Each FTP proxy server may have each own mode, it's possible to select more appropriate mode for current FTP proxy server or firewall. Firewall or proxy server address in local network. Firewall or proxy server port. Firewall or proxy server username. It can be empty if not specified at firewall or proxy server. Firewall or proxy server password. It can be useful for coping only recent files.